This is winter comfort food at its finest! For the ossobuco, place the beef shin in the seasoned flour and toss to coat thoroughly. Heat ½ of the olive oil in a large stove-to-oven casserole dish and brown the beef shin in batches over high heat, about 10 minutes per batch. Remove from the dish and place on paper towel to drain. Repeat until all of the meat has been browned, adding a glug of the remaining olive oil between each batch. Preheat the oven to 140°C. Using the same casserole dish, sauté the onions and 3 garlic cloves until the onions are soft and translucent, about 2 minutes. Add the tomatoes, carrots, celery and tomato paste, and fry, about 5 minutes. Add the browned beef, wine, stock, sugar, bay leaf and seasoning. Stir until well combined. Cover and bake in the preheated oven until the meat is tender, about 2 hours. When baked, remove the meat from the casserole dish and set aside. Place the dish on the stove over medium heat, simmering gently to reduce the sauce until thickened, about 10 minutes. Return the meat to the casserole dish. Set aside. For the polenta, whisk the polenta and the boiling water together in a large pot over medium heat. Simmer until the polenta starts to pull away from the sides of the pot, about 5 – 10 minutes. Stir in the butter and cream. Season to taste. For the gremolata, mix the 2 garlic cloves, parsley and lemon zest together. Set aside until needed. 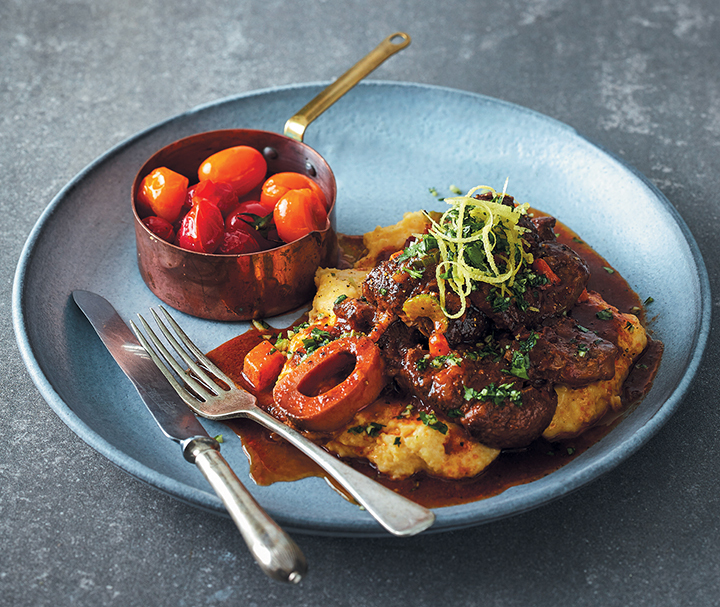 Top the ossobuco with a spoonful of gremolata and serve on a bed of polenta. Enjoy with roasted baby tomatoes alongside.